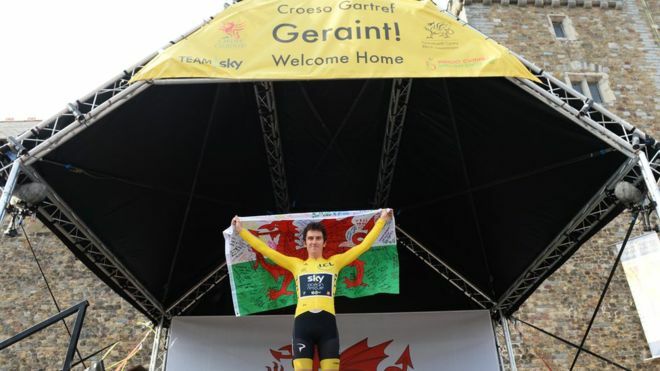 Tour de France winner Geraint Thomas will be welcomed home to Cardiff later on Thursday, with thousands of people expected on the streets of the capital. The 32-year-old will be congratulated by First Minister Carwyn Jones at the Senedd at 16:25 BST before a celebration outside Cardiff Castle. 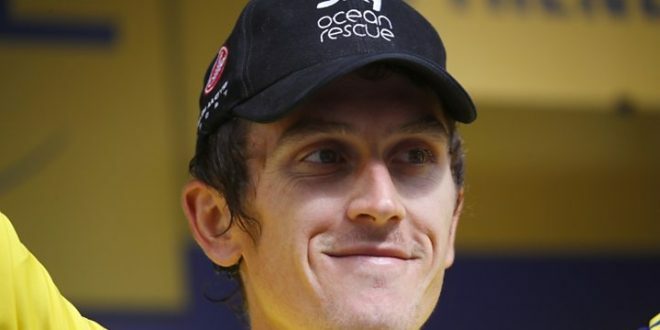 Thomas became the first Welshman to win the gruelling 21-stage race after it culminated in Paris last month. He said he had been “blown away” by support from people in his home city. Mr Jones, who will join Thomas on the steps of the Senedd, described the triumph as “a stand-out moment in our sporting history”. “I believe Geraint’s thrilling ride to Paris is the greatest individual performance by a Welsh sport star,” he said. Thomas follows in the footsteps of two other former Whitchurch High School pupils in being recognised in the city. In 2012, then Welsh rugby captain Sam Warburton enjoyed a Grand Slam celebration at the Senedd, while Gareth Bale and Wales’ football heroes brought Cardiff to a standstill with a Euro 2016 homecoming after reaching the semi-finals. Thomas’ achievement also saw him immortalised in the same way as the great Welsh rugby players in the 1970s, with performer Max Boyce penning a poem about him. Following a short appearance on the Senedd steps, Thomas, who has also won two Olympic gold medals, will lead a peloton of young riders up St Mary Street, in the city centre. He will then take to a stage outside Cardiff Castle from 17:00 until about 17:30. One of the young riders following Thomas up St Mary Street will be 12-year-old Elliw, from Rhostryfan in Gwynedd and a member of Dwyfor Cycling Club, who said she was “so happy” to have her name pulled out of a hat. “It is a once in a lifetime experience, it’s going to be great,” she said. 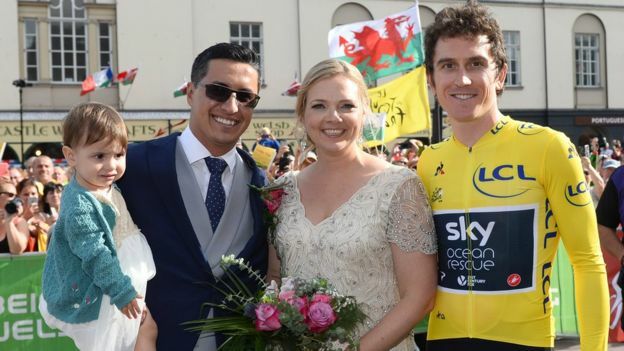 Thomas said ahead of the event: “I’ve been blown away by the support since the Tour de France – from everyone, but especially the Welsh public. 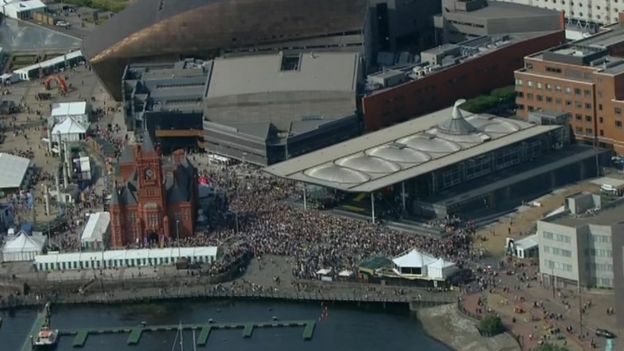 Cardiff council leader Huw Thomas said everyone in the city was “extremely proud” of the “landmark victory” while Welsh Cycling’s Anne Adams-King said cyclists from across Wales were looking forward to sharing “this once in a lifetime moment”. To celebrate his historic win, a 10ft-high graffiti mural depicting Thomas in his yellow jersey has been painted on a wall Maindy leisure centre overlooking the track used by the Maindy Flyers Cycling Club’ , where his love of the sport began. “I think we needed to portray that to younger people and just people generally, that they anyone can be a champion,” said Cardiff-based artists Keiron Jones, whose painting was commissioned by BBC Wales News. Thomas’ former coach Debbie Wharton, who recalled him joining the Maindy Flyers after leaving a swimming lesson, said it was “overwhelming” to see him achieve what he has. “It is unbelievable, overwhelming, something we never, ever dreamed of or had the thought that this would happen,” said Ms Wharton. Debbie Wharton, childhood cycling coach of Geraint Thomas, said she was “really proud” to see him competing for the biggest prize in cycling. Thomas’s brother-in-law Rhys, who coincidentally shares his surname, said Geraint had been out cycling with his dad and rugby player George North on Wednesday to unwind. “My dad loves it – my dad’s name is Thomas as well so he gets all Geraint’s old kit and it says Thomas on it so he thinks it looks super cool,” he said. 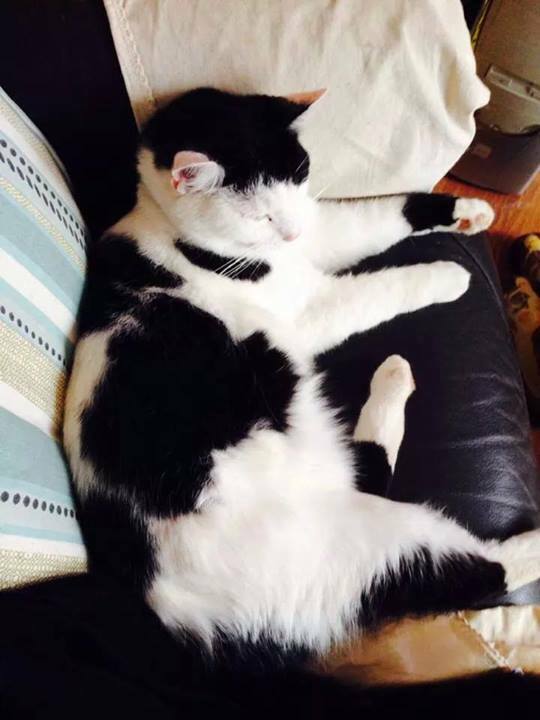 Thomas was born in the Cardiff suburb of Birchgrove and went to Whitchurch High School, starting to cycle at the age of 10 at the Maindy Flyers club. High Street will be closed from 10:00 until 22:00 for the event while many other roads will be partly closed from 15:00 until 20:00. Stretches of St Mary Street, Wharton Street, Castle Street, Duke Street, North Road and Cowbridge Road East, will be affected.